Helen Keller | Monroe, NY - Rest Haven, Inc.
Tax Deductible Contributions to Preservation of Rest Haven 501(c)(3): Click to Donate Now! 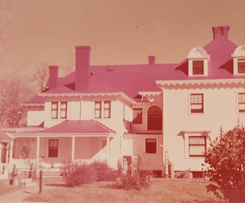 It was once written, "whether the name "Rest Haven" will have furture significance, or simply become a part of Monroe's history, is the question" to be answered. On March 23 2017, Rest Haven's long awaited recognition to her contribution to society as an Adult Home Residence for the Blind, Disabled and etc has become the next milestone as an historical site in Monroe New York. There are two historical designations being awarded: 1) Criterion C: "in the area of Architecture, as a substantially intact example of Colonial Revival-style domestic design erected ca 1903" and 2) Criterion A: "in the area of Health/Medicine, for its role as Rest Haven, which provided a place of retreat and respite for the blind." (William E. Krattinger 2017 Nomination papers) NYS Preservation Analysis, William Krattinger and Committee, recommending that Rest Haven should be looked at as a National Landmark. Preservation of Rest Haven has been organized to restore the original Rest Haven Home for the Blind to its original glory days. We have assembled and will continue to assemble a fascinating collection of information from a number of sources to illustrate the history of this "Stately Mansion" (1903). In 1923, the house was named as one of the most beautiful Homes in Monroe. Helen Keller served as a board trustee and worked to keep Rest Haven's doors open until her death in 1968. On March 23 2017, exactly one year to the day that we signed the contract to buy the property, Rest Haven was designated an historical site. Our hope is to complete its restoration to educate and inspire future generations to come. Now, on April 19 2017, the Warwick Valley Dispatch writes a follow up story 114 years later. The Wright family has owned and operated this paper since 1885. Formerly a home for the blind in Monroe, New York, Rest Haven, Inc., is a historical building owned by HRR Corp. Having been locked away for a long time, it is our goal to renovate the property to capture its original look while promoting its historical significance and the impact that inspirational American author and teacher Helen Keller had on the blind community who lived there. 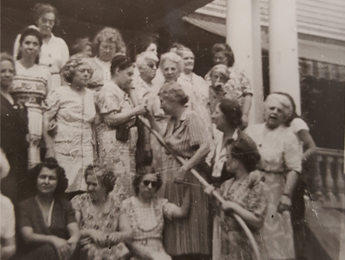 From 1923 to 1968, Rest Haven functioned as a home for blind women. Historical information has shown that Helen Keller had a large impact on the management of the home, serving as a board trustee until her death in 1968. HRR Corp. is dedicated to preserving this invaluable historical site by reopening its doors and allowing the public to walk the grounds that Helen Keller once did. Inspired by his three daughters, April, Kimberly, and Katie, Mr. Mitts hopes to unlock a piece of history that had been lost over time. April is helping with the project, while her sisters Kimberly and Katie complete their RN degrees from Pace University™. Though many are familiar with the life and legacy of Helen Keller, we are honored to be renovating this historical site for others to enjoy, while gaining inspiration from its historical importance and beauty.